We've learnt a lot about all sorts of Comb Jellies, but now it's time to look at a rebel in their ranks, the black sheep of the family. Actually it's the black sheep of the entire phylum. The other Comb Jellies swam free in the water, using their waving combs to roam the open ocean in search of prey to capture with their sticky tentacles or cavernous mouth. Platyctenids are completely different, to the extent that most of them don't even have the eponymous combs at all. Platyctenid Comb Jelly describes the fact that they're flattened, since "platy" means flat or broad. It doesn't tell you that most are only about 1 cm long, so I'll have to do that instead. Also, the mouth faces downward. Just a little more detail on exactly what kind of "flattened" we're talking about here! Benthic Comb Jelly explains that they live on and near the sea floor. 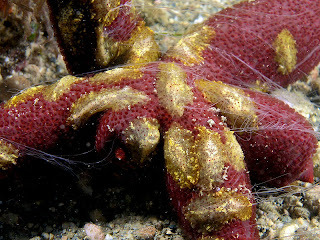 They might be stuck to algae or rocks, or they might venture onto slow or non-moving animals like starfish and sponges. Sometimes there're way too many of them and it ends up looking like one of those inadvisable Indian trains. Benthic Comb Jellies are unlike their relatives in using all sorts of colours and patterns to try and blend in with their surroundings. It doesn't always work out so well. Sometimes they stick up like a sore thumb. A bright, stripy, sore thumb. One wonders if the transparency of other Comb Jellies isn't such a bad idea after all. Anyway, what about Slug Jelly? That seems to describe their shape and life habits quite well. It also indicates that Slug Jellies can in fact move around on their home surface. As you'd expect, they achieve this by turning their mouth and throat inside-out and using it like a slug's foot. So I suppose they're basically using heavy smooching. Maybe the starfish kinda likes it, then? And of course there are the 2 sticky, branching tentacles used for catching their plankton food. They are sometimes at the end of fleshy stalks and are long and well developed to compensate for their sedentary lifestyle. There's another difference between Platyctenids and other Comb Jellies - they are able to clone themselves. A little bit just breaks off from the edge of their body and grows up into an adult. They also reproduce sexually, where the female holds her young in a little pouch until they are old enough to emerge. Eventually, the youngsters swim away. That's right, swim! When young, they look just like a normal Comb Jelly. It's only later that they metamorphose and find a comely surface to place their desirous lips upon. How in the world do these deep sea creatures acquire superpowers that otherwise only appear in science fiction stories? I know what you mean! It seems to me that science fiction stories try to keep a couple steps ahead of reality. Then we discover more about reality and a whole lot of fiction stops seeming quite so fictional. Don't we all move about freely when we are young, and eventually get settled into a sedentary lifestyle, rarely venturing beyond our starfish to wave our tentacle stalks at new and exciting things? I was with you up to 'tentacle'. I just look up exciting things on the internet!